Activate body’s self-healing power with Foot Massage! To reduce heart disease with foot massage, you need to massage the foot’s heart area. Foot massages are a simple and effective way to better health. It activates your body’s self-healing power. It’s free, you can do it yourself or whenever you need a boost of health. 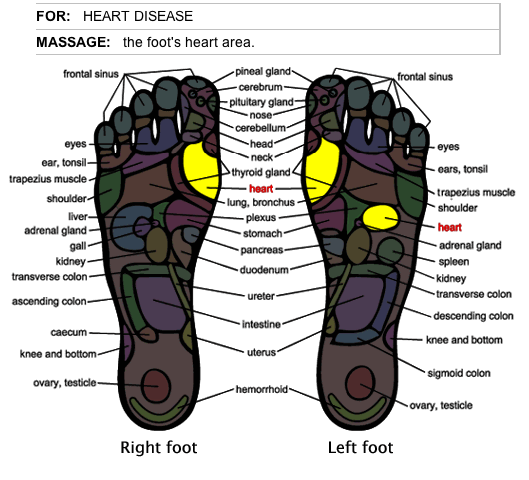 First, find out the locations of the foot’s heart area on your feet, use the massage chart I provided here as a reference. Second, use your finger, knuckle, or the end of a smooth stick to press down and apply firm pressure to that area. Another way is stepping on a golf ball or pebbles with your bare feet, which gives you the same effect. At first, it might hurt a little bit, but that is because the internal organ related to this area is not function properly. If this happens, you shouldn’t press too hard, but definitely keep working on that area. About Chinese Foot massage: According to Chinese Medicine, the foot is, in fact, a separate body, which is directly related to all of our body parts and organs. Your foot is divided into many different vital-energy sections, which can treat different areas of your body. By massaging a section of the foot, the corresponding body area receives specific therapeutic treatment. So, by stimulating one or a combination of areas, you will in turn be massaging the corresponding body muscles and organs. It’s important to drink plenty of warm water after the massage, to help clear away toxic substances in our body. You should not use this information to diagnose or treat any health problems or illnesses without consulting your health care practitioners.